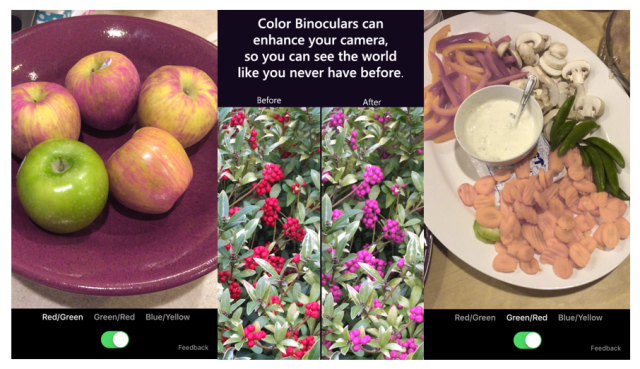 In a bid to brighten up the world of Colorblind users, Microsoft has developed a novel Color Binoculars app. The new app, 9.4 MB in size makes use of the phone's camera to adjust colors correcting the brightness, darkness, and other levels of the visual on screen. It assists in all the three types of color blindness- which reduce red light, green light, blue light sensitivity respectively. Designed and developed by Microsoft's Garage Team, a team focused on making products completely different from the company's core business portfolio, the app makes reds brighter and greens darker so that the difference is more obvious. It further replaces difficult color combinations, like red and green, with more easily distinguishable combinations, like pink and green, enabling the color-blind user to see visuals in the same way as a normal user, quoted Tom Overton, the creator of app, in a blogpost. Color blind people often miss out on the full spectrum of vibrant color life has to offer owing to their anomaly. 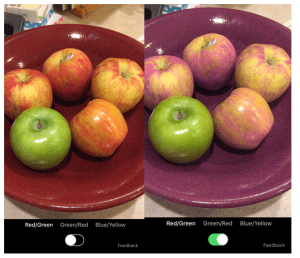 The app offers three modes, one for each of the three most major types of colorblindness: red/green, green/red, and blue/yellow with an option to turn off the color correction, so as to easily swap between what one normally sees and what a non-colorblind person sees,contrasting the differences. The app exclusively launched for iPhone users, is compatible with iOS 9.0 and above on iPhone, iPad and iPod touch. It will be available as a free download for US users alone for now.